Outdoorer has an addition to its great Zack Premium pop-up beach shelter in blue; there is now a smaller version for children, from babies to toddlers, in the range. 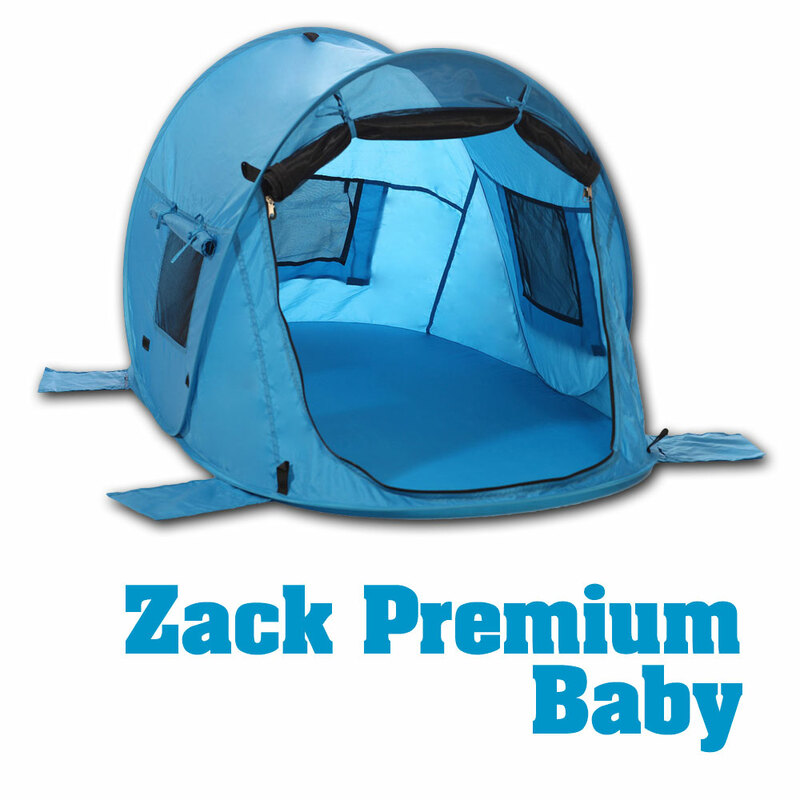 The children’s Zack Premium Baby beach shelter is equipped with the same great features as the larger-size model, but also comes with a mosquito net at the entrance for closure. 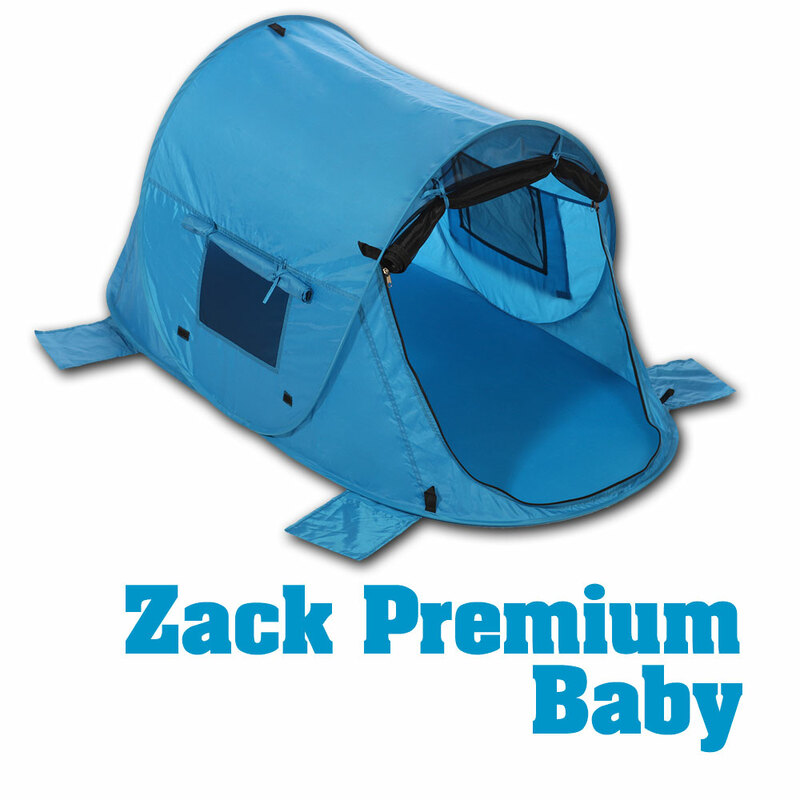 Like the other Zack models, the children’s Zack Premium Baby beach shelter sets itself up. These pop-up beach shelters are easily to set up and are ready to use in a second. You just take it out of the transport bag and toss it down at the desired location. Even your child can set it up. To make take-down just as quick, an illustrated guide is included and there is also a take-down video on YouTube. You can find the link to it on the manual. Outdoorer takes the sun protection of small beach visitors especially to heart, because their skin is much more sensitive to sunlight than that of adults. 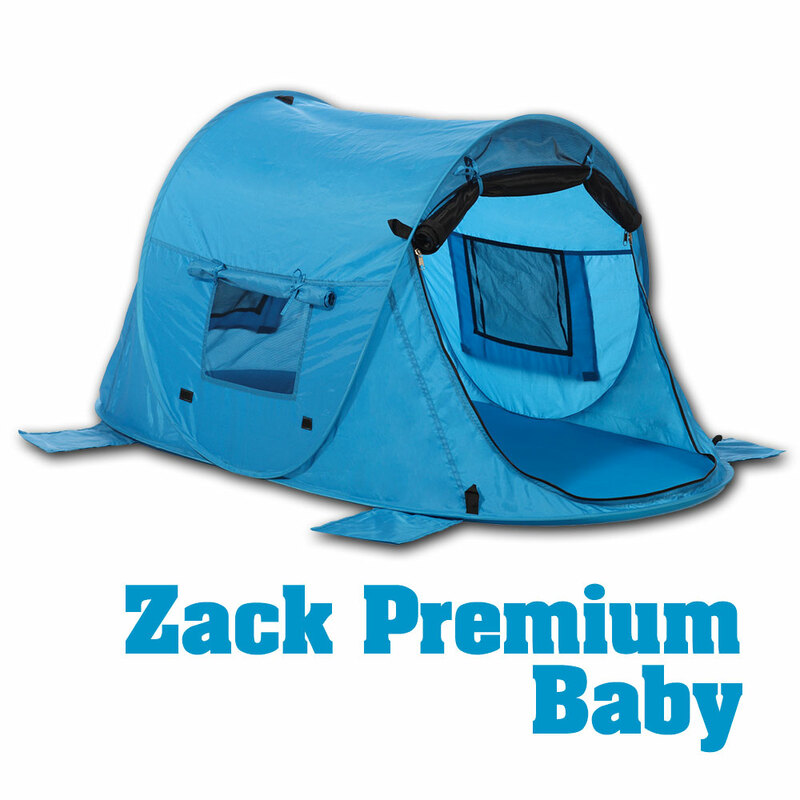 The children’s Zack Premium Baby beach shelter is therefore equipped with the very high sun protection (factor UV 80) according to Standard 801 (valid only with the windows closed). This was certified by the renowned Hohenstein Institute. For the baby beach shelters in particular, only the best UV protection is good enough. As a highlight for the children’s Zack Premium Baby beach shelter, Outdoorer has come up with something very special – a lockable zippered mosquito net for the entrance. Thus your child can retreat to it to rest and you do not have to worry about bees or other insects getting in. If the net is not needed, then you can easily and quickly bind it to the top with twist ties. Like the bigger pop up beach tent, the children’s Zack Premium Baby beach shelter is equipped with three closable windows. These can be opened according to the direction of the sun or wind and also closed again quickly. The children’s Zack Premium Baby beach shelter is easy to transport because the size and weight are specially designed for traveling. Measuring 45 x 45 x 2 cm and with a weight of about 820 g, it fits neatly in the boot. So you don’t need to do without the practical beach shelter for your children when traveling by air. The children’s Zack Premium Baby beach shelter can not only be used as a beach shelter on the beach, but also as a travel cot. Especially for air travel, its small pack size, low weight and easy transportation are unbeatable. Normal travel beds can easily weigh 10 kg and can not be treated as an extra piece of luggage. With the Zack Premium Baby as a travel cot as you have a clear advantage. 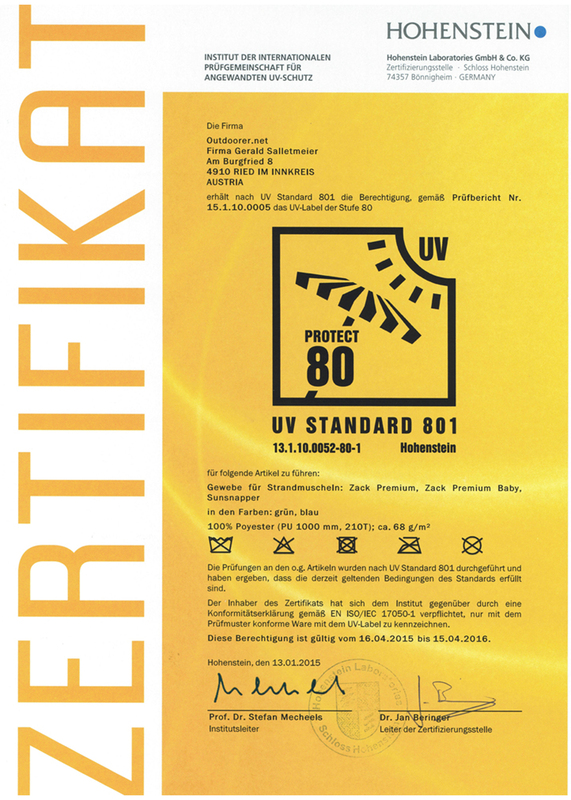 You have versatility, because it protects your child from harmful solar radiation whether at the beach or in the garden. For optimum stability on the beach, the children’s beach shelter comes with 4 sand bags. You can fill these and it will stay stable even in windy conditions. Additionally pegs and guy ropes are included. For a very fine sandy bases, Outdoorer recommends the use of Sand Fortress sand pegs. Thanks to their V-profile they offer a rock solid hold to the site. Upon take-down, release them easily by pulling vertically upward. Where can you order Zack Premium Baby? The Children’s beach shelter & travel cot is available at Amazon. Watch our dismantling video for the Zack Premium Baby beach shelter.